Anchor Bay’s 35th Anniversary Edition Blu-ray release of John Carpenter’s Halloween is quite simply the best that the 1978 classic has ever looked or sounded, with just enough bonus features included to make this the definitive must-own for your collection. With a crisp new high definition transfer that was personally overseen and approved by Carpenter’s favorite cinematographer Dean Cundey, Haddonfield has never looked better. When Michael Myers comes out of the darkness just over Laurie Strode’s shoulder late in the film, it’s as effective as ever with the stark white of Myers’ trademark mask cutting a haunting image through the rich blackness, just as Carpenter and Cundey originally envisioned. Earlier when Michael is watching Laurie walk down the sidewalk singing “I wish I had you all alone, just the two of us,” I was astonished at the detail of the bushes blowing in the breeze for what looks like miles beyond the scene. The new 7.1 audio mix brings out little background details that I could never completely make out before, like the cheerleader chants in the background as P.J. Soles’ character of Lynda is introduced (“We’re from Haddonfield, couldn’t be prouder. Can’t hear us now? We’ll yell a little louder!”). Those of us who have cherished the 25th Anniversary Edition DVD that was released by Anchor Bay in 2003 will no doubt recognize some of Carpenter’s anecdotes as nothing new, but it’s still great to hear the director interact with Curtis throughout the just-under-90-minute running time. It is even stated in the commentary that this is the first time that Carpenter and Curtis had ever watched a movie together that they had worked on. A real treat for fans is The Night She Came Home, an hour-long documentary made by Curtis’s sister and brother-in-law, following the actress as she attends this summer’s HorrorHound Weekend, her first and only convention appearance, to raise money for the Children’s Hospital of Los Angeles. Though the sound and picture quality of the doc don’t come close to that of the film itself on this release, The Night She Came Home is as much a heartwarming tribute to Curtis’s most die hard fans as it is a love letter to convention goers in general, to many of which Curtis represents “the Holy Grail”. Also included is about 10 minutes of extra scenes that were filmed during the making of the first sequel in 1981 for the television version (“Extended Cut”) of Halloween, which first aired on NBC that same year. Rounding out the bonus features is the classic theatrical trailer (which shamelessly spoils pretty much the entire film), as well as three vintage TV spots and three old school radio spots, and a featurette left over from the 25th Anniversary release that includes interviews with producer Debra Hill and actress P.J. Soles revisiting some of the South Pasadena, California locations where Halloween was shot. 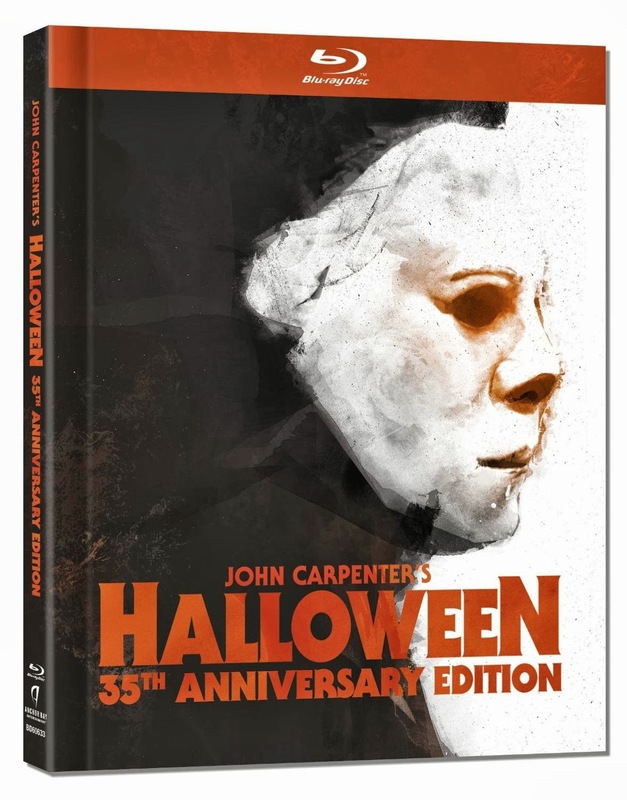 An extra treat is that the new Blu-ray case actually opens up to include a 20-page book, featuring many rare and candid black-and-white photos taken during the filming of Halloween, and a loving history of the groundbreaking movie written by Steph Hutchinson, who wrote many of the Halloween comic books. John Carpenter’s Halloween set the standard for modern horror, and the new 35th Anniversary Edition Blu-ray is the ultimate celebration of the night He came home. Write your own review in the comments! John Carpenter’s ‘Body Bags’ Coming to Blu-ray from Scream Factory!